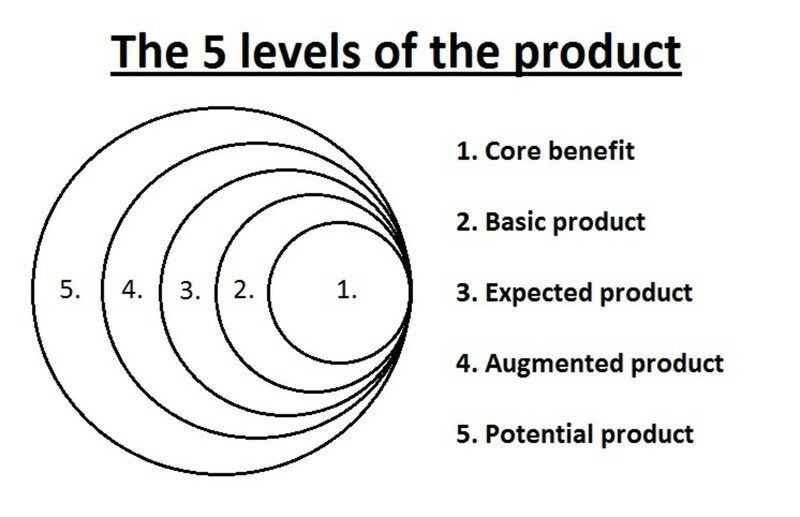 Product Level: Marketers plan their market offering at different five levels, as shown in the given figure. Each level adds more customer value, and together the five levels constitute a customer value hierarchy. 1) Core Benefit: The service or benefits the customer is really buying.This is the reason for what you are buying the product.Remember, it is a reason not a product itself. For example: We buy spectacles for clear view.So here 'Clear view' would be a core benefit. 2) Basic Product: It is a name of the Basic Product that you are buying. For example: In above example we are buying Spectacles, so Spectacles is basic product. 3) Expected product: At third level, Marketers prepared the expected product, a set of attributes and conditions buyers normally expect at the time of buying of the product.For example: In above example, Clarity of vision is the expected attributes of the customers. 4) Augmented Level: At the fourth level, marketer prepared the product that exceeds customers expectation. Brand Positioning and competition take place at this level.For example: In above example, colour glass, glass with wiper can be a augmented level. 5) Potential Level: Fifth level is Potential Level, which emcompasses all the possible augmentation and transformation in future. That is the company search for the new way of satisfying the customers and distinguised the product from others. For example: In above example: Spectacles to see Solar Eclipse can be a example of potential level. The level you move forward in the product level chart, the more the complex and expected product would be. In Augmented level, marketers provide the product which is beyond the expectation but its possible where as in potential level marketers provide the product which is beyond the expectation and seem to be impossible.In above example, spectacles to see Solar Eclipse is almost impossible now.